One of Vancouver Island’s premiere events is set to go on the coming long Victoria Day weekend, May 18 – 20. 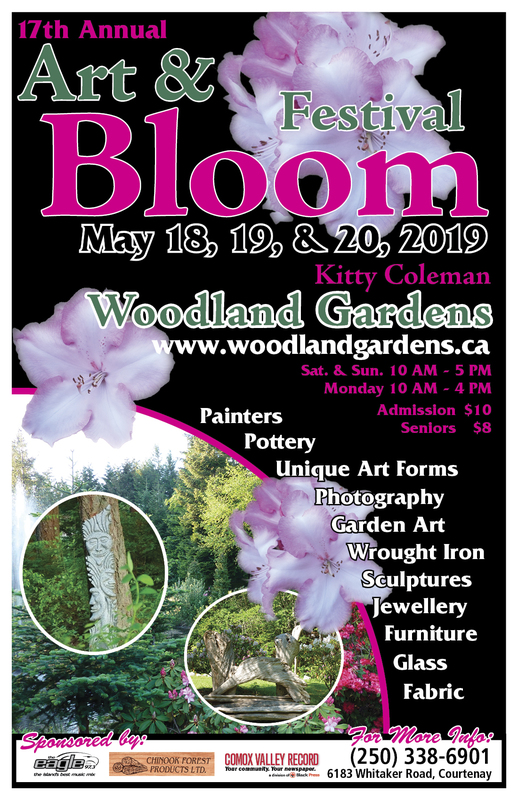 The Kitty Coleman Arts and Bloom Festival is one of our favourite attractions, bringing together a spectacular 24-acre venue, dozens of talented artists working in many genres and a panorama of colour and visual delight courtesy of the 3,500 rhododendrons that grace the site. When Bryan Zimmerman started a small rhododendron garden on his property at Kitty Coleman six years ago, he didn't expect it to grow into what it has become today: Kitty Coleman Woodland Gardens. "I started to uncover a lot of interesting features and I just got carried away. I kept uncovering these hidden treasures in the woods," said Zimmerman, who ran a fruit farm and greenhouses on Ontario's Niagara Peninsula prior to moving out west and settling in the valley. Zimmerman and his wife live on the property in a house that also does duty as a tea room. "Without Bev's support and co-operation I wouldn't be able to do this," said Zimmerman. Five years after opening the woodland gardens to the public, Zimmerman's 24 acre property now features two miles of cedar bark paths, benches, a gazebo and multiple water features including several interesting fountains. And of course, rhododendrons. "Rhododendrons are a highlight feature," said Zimmerman. "They belong in the woods. They belong in a natural setting. It shows them off to their best." Zimmerman has done all of the work on the property himself and readily admits that he could easily keep three or four employees busy. He also admits that he prefers to work alone. "I'm picky and a bit stuck in my ways," said Zimmerman, smiling. "Nothing is easy, everything is the wheelbarrow way. The hard way." One of the reasons Zimmerman chose to work by hand was to avoid damaging the native plants and undergrowth. Excavators are only used when there is a lot of earth to move and no other choice. Zimmerman works with local excavator operator Russ Henderson of Rock and Road. "He's a sculptor with a backhoe," said Zimmerman. One of the early incarnations of the gardens that still proves popular each winter is the Kitty Coleman Christmas Tree Farm and Santa's Barn. "Lots of people come out to get a tree," said Zimmerman, who also noted that Santa himself is a pretty big attraction for children. The barn, which seats 100 has also hosted weddings. "People say, "What? You're getting married in a barn?" Then they see it and just go, "Wow." The gardens also attract a large number of visitors from around the world throughout the year. European visitors often remark to Zimmerman that if his gardens were in Europe, they would be a major destination. "Our guest book is like a geography lesson," said Zimmerman. "It's neat to talk to people and see their reaction to the gardens." One of the reactions Zimmerman notices regularly among visitors is the positive effect a walk through the garden has on people. "Alot of people say it's almost a spiritual experience and very therapeutic .A person just feels better after going into the garden and listening to the birds and the creek." Zimmerman is not one to let the grass grow under his feet,however, and has plans to expand the gardens with more trails and features including 5,000more rhododendrons and a lake. Additionally he would like to see the gardens play host to an arts and culture event. "I want this to be an annual event featuring artists, potters and musicians working at their crafts. The concept would be working with nature, not against it," said Zimmerman, who added the only thing holding him back was the need for a coordinator for such an event. "I think this type of venture lends itself to success, especially at that time of year. We could have wandering minstrels on the trails and belly dancers in the Bridal Meadow." Zimmerman feels the event would have two purposes-to expand the gardens and to attract local visitors. "What I'm trying to create here is for the Valley. I want the gardens to be for the Comox Valley what the Butchart Gardens is to Victoria." As if Zimmerman doesn't have enough work to do on his own garden, he also works as a landscape designer and garden consultant. Standing in the middle of his gardens,even Zimmerman is impressed with what he sees. "When you believe in something that much, its amazing what you can do. It blows me away, what I've done." We set out for one of the unique nearby gardens, just a 40- minute drive north, up the island past Comox, along the Oceanside Route. Locals tip us off about Kitty Coleman Woodland Gardens, a hidden treasure of natural wild beauty and full of surprises, named for a mysterious woman of local legends. After entering through a rustic log barn, we use a self- directing map that shows the extensive network of trails to explore on this 24 - acre property. The gardens feature 100 varieties of trees, 3,5000 rhododendrons, and an abundance of ferns and flowers. We walk leisurely along the meandering cedar bark pathways through shady forests that open onto sunlit Bridal Meadows, then to Allison Island Pond, spying the elusive Myrtle, a one-eyed turtle. Sitting on a hand-made bench, we marvel at the peaceful scenery and vibrant blossoms of Woodland Lake with its Azalea Island, the kind of ambiance that instantly soothes the spirit. Winding along a ridge to Moonlight Garden, we discover that numerous driftwood sculptures, ponds and fountains, are given a special place in the gardens. Woodland Gardens is a feast for the senses, and nature's healing powers contained in this serene beauty bring a calmness and tranquility to the soul. When Bryan Zimmerman started a small rhododendron garden on his property at Kitty Coleman six years ago, he didn't expect it to grow into what it has become today: Kitty Coleman Woodland Gardens. "I started to uncover alot of interesting features and I just got carried away. I kept uncovering these hidden treasures in the woods," said Zimmerman, who ran a fruit farm and greenhouses on Ontario's Niagara Peninsula prior to moving out west and settling in the valley. "A lot of people say it's almost a spiritual experience and very therapeutic .A person just feels better after going into the garden and listening to the birds and the creek." Zimmerman is not one to let the grass grow under his feet,however, and has plans to expand the gardens with more trails and features including 5,000more rhododendrons and a lake. Additionally he would like to see the gardens play host to an arts and culture event. When Bryan Zimmerman bought a 24-acre piece of bush just north of Courtenay on central Vancouver Island, he had no idea that he would become obsessed with it - or that it would attract visitors from all parts of the world. What began as a few rhododendrons around the house; has become one of Vancouver Island's premiere natural gardens. Now eight years old, Kitty Coleman Woodland Gardens is a mix of shady forests and sunlit meadows bounded on one side by Kitty Coleman Creek. Meandering bark mulch paths take visitors past 100 varieties of trees, a profusion of ferns and numerous water features. Lupines, iris and 3,500 rhododendrons add vibrant splashes of color while more delicate flowers such as bleeding hearts and sweet boxwood hug the forest floor. Zimmerman comes by his love of growing naturally. He was born and raised in Grimsby, Ontario where his family ran a commercial fruit farm. Thirty years ago Zimmerman and his wife, Bev, moved to British Columbia. They grew fruit in Kaslo for five years before moving to the Comox Valley with their three young sons. We always spent our holidays in the Courtenay area, Zimmerman says. So we thought we might as well live here. Over the following years Zimmerman cleared enough of their 24-acre parcel to run a U-cut Christmas Tree Farm. It wasn't long before his Santa's barn was a regular gathering place for locals during the Christmas season. Then Zimmerman decided to clear a small area near the house for a rhododendron garden. "I guess I got carried away" he admits. "When I started the bush was so thick a bird couldn'fly through it. But as I cleared the brush and pruned the understory I kept discovering treasures; a berm, a stump with huckleberries growing out of the top of it and I just kept going. In the end I was so impressed by the beauty I found that I wanted to share it with others. But what is really amazing is that Zimmerman, now 63, does all the work himself - and by hand. I don't want to destroy the natural setting by bringing in heavy machinery,"he explains. "So I clear everything by hand, haul the debris out in a wheelbarrow and have even dug all the ponds, except for Woodland Lake, myself. Every year I wheelbarrow in at least 200 yards of bark mulch to redo the trails. He also packs in rock from nearby Mt. Washington and makes rustic benches that are strategically placed throughout the gardens. Among the many features of the upper garden is the moonlight garden, the bridal meadow, various fountains and ponds and Woodland Lake with its Azalea Island. Just behind Beverley's Lily Pond one can see the ridged back of Spikey the Dinosaur, a rock arrangement named by Zimmerman's granddaughter, Allison, when she was two years old. "I had no idea I was creating a dinosaur," Zimmerman says, "but once Allison pointed it out, I could see she was right." While the upper level is slightly more formal and fairly flat the lower, or hidden garden, is more challenging. There are some steep spots in the trail as well as some stairs. But the rewards are worth the effort. This area is more secluded, thus making it more likely that one will see river otter, deer, mink or woodland ducks. Several of the lower trails lead to Kitty Coleman Creek. This small stream and a nearby beach and park were named after a mysterious native women that people called Kitty. Apparently Kitty paddled ashore by herself one day in the late 1800s. She planted a small garden, fished and picked berries. Eventually she moved in with a fellow named Coleman. The interesting thing about Kitty was that rain or shine, fishing or berry picking, she always wore a long, black silk dress. A few years after she appeared, Kitty slid her canoe into the water and disappeared. Zimmerman's gardens are an evolving work of art. Every year he adds at least one new feature and the rhododendrons that he planted years ago have become enormous. Zimmerman has a knack for knowing when to leave nature alone and when to add a discreet shrub or two and it is this blend of the cultivated and wild that makes Woodland Gardens unique. Visitor's signing the guest book leave addresses from Great Britain, Australia, New Zealand and Europe as well as almost every state in the U.S. They regularly use words like"amazing," "enchanting" and "unbelievable." Tour groups from the National Trust in England and the Montreal Garden Club have called Zimmerman's gardens "one of the world's finest informal gardens." "People often make a day of the gardens," Zimmerman notes. "They'll bring a picnic lunch and tour one part in the morning and the rest in the afternoon. Once in awhile I'll notice that a car's been in the parking lot for a long time and go looking just to make sure someone isn't in trouble. I almost always find them reading, bird watching or just contemplating at Point Maxwell, Deer Beach or Best Seat in the House." You can find Zimmerman working in the gardens every day from daylight to dusk. He's the tall, quiet man dressed in a denim shirt and pants and frequently followed by his three dogs. "Being in the gardens is part of my life," he says. "I haven't had a holiday in eight years and I don't miss it. He does, however, admit to getting tired occasionally. "If it's a nice day, I'll just lay down under a tree and have a nap," he explains. "When the body says its time to rest you should listen to it. The dogs usually curl up around me and bark if someone comes along. I've surprised a few visitors. They always ask ,"Do you work here?" "I have no interest in retiring," Zimmerman continues. "To me retiring is giving up. What I do is hard on the body but I have a very keen interest and that means a lot. Sometimes I lay awake at night planning what I'm going to do the next day. I always have a positive reason to get up in the morning. And the feedback I've gotten has been tremendous. It really keeps me going." As well as an ever-changing panorama of foliage and blossoms, numerous special events take place at the gardens throughout year. During the month of December Santa's Barn and the forest sparkle with lights and chamber choirs lead evening walks through the woods. There is a fine arts show every May and an artisans' festival on Labor Day weekend. The gardens are also available for weddings, teas and other gatherings. Guided tours for groups and the tearoom are available by advance reservation. Kitty Coleman Woodland Gardens is open daily year round from 9:00 a.m. until dusk. From Courtenay take the Old Island Highway north for 15 minutes then follow the signs. Wear good walking shoes and take a jacket as it can be cool in the shady areas. For more information call 250-338-6901 or to view a map and sneak a preview of the gardens visit www.woodlandgardens.ca.